Carl R. Hagen, Professor of Physics at the University of Rochester, was both thrilled and surprised today when he learned that he is one of six recipients of one of the most prestigious prizes in his field: the 2010 American Physical Society's J. J. Sakurai Prize for Theoretical Particle Physics. The annual prize recognizes and encourages outstanding achievement in particle theory. Hagen was honored by the American Physical Society for "elucidation of the properties of spontaneous symmetry breaking in four-dimensional relativistic gauge theory and of the mechanism for the consistent generation of vector boson masses." He shares the prize with Robert Brout and Francois Englert of the Université Libre de Bruxelles, Gerald S. Guralnik of Brown University, Peter W. Higgs of the University of Edinburgh, and Tom W. B. Kibble of Imperial College. "Hagen is one of the most important theoretical particle physicists of his generation," says Nicholas P. Bigelow, Chair of the Department of Physics and Astronomy. "This prize is long overdue. I cannot express strongly enough how proud we are to have Carl Hagen on our faculty." A March 2008 article ("Nobelist Steven Weinberg Praises Professor Carl Hagen and Collaborators for Higgs Boson Theory") on the Department website describes the crucial contribution regarding the Higgs boson theory made by Hagen with his collaborators Guralnik and Kibble. It points out that three independently formulated papers describing the theoretical mechanism appeared in Volume 13 of Physical Review Letters in 1964. They were by Gerald Guralnik, Carl Hagen, and Tom Kibble; by Peter Higgs; and by Francois Englert and Robert Brout. All three papers were written from different perspectives, and each made a distinct contribution. And now, all six professors are sharing the 2010 J. J. Sakurai Prize for their suggested methods that give mass to vector bosons. "In part," says Hagen, "this may be due to widespread discussion based on a July 2009 paper by Gerald S. Guralnik." This paper, "The History of the Guralnik, Hagen and Kibble Development of the Theory of Spontaneous Symmetry Breaking and Gauge Particles," describes the state of theoretical particles physics in the 1960's as well as in modern times. It examines everything from quantum field theory to the Goldstone theorem, described briefly below, to the theories spelled out by all three of the papers in Volume 13 of Physical Review Letters in 1964. In short, a theorem associated with Jeffrey Goldstone asserts that, any time a continuous symmetry group is broken, there is an accompanying effect that requires the appearance of massless particles. There is no room in the particle zoo for massless bosons in addition to the photon. Yet the 1964 papers each independently solved the problem of a physically sensible broken symmetry theory of elementary particles by noting that the Goldstone theorem includes manifest relativistic invariance in its core of underlying assumptions. Since particle physics experimentalists had yet to detect the slightest breakdown of relativistic invariance, this hardly seemed to offer escape from the deadening hand of the Goldstone theorem. However, the three papers observed that, in dealing with gauge theories, there was an exception. This comes about because in a manifestly relativistic invariant formulation of the photon-like gauge field, the massless particles of Goldstone could merely have been unobservable so-called gauge excitations. In fact, there exists another formulation that is relativistically invariant (though not manifestly so) and free of these gauge excitations. This alternate approach, when combined with a symmetry-breaking two-component scalar field, allows the two transverse modes of the photon-like field to combine with one scalar field component to yield the three modes required for a massive vector particle. The leftover scalar field is a particle, and it is this particle that was first called the "Higgs" by Ben Lee in his talk at the 1966 Rochester Conference held at Berkeley. Many physicists believe that the W and Z bosons, as well as quarks and leptons, all obtain their masses because they interact with the Higgs field. Rather than having mass to begin with, they obtain it, and thus the particles conform to the symmetry that the weak force requires. The unification of vector gauge fields with scalar fields to form vector particles led to the detection of the W and Z vector bosons, and it also led to the 1979 Nobel Prize. The contributions made by all three papers -- Gerald Guralnik, Carl Hagen, and Tom Kibble; by Peter Higgs; and by Francois Englert and Robert Brout -- cannot be overstated. They formed the basis of unified electroweak theory, and they predicted what scientists believe is the origin of mass. 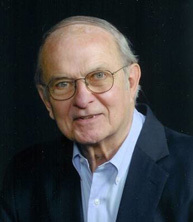 The 2010 J. J. Sakurai Prize will be presented at the American Physical Society's February 13-16 meeting in Washington, DC at a special ceremonial session. The prize consists of $20,000, to be split among all recipients, and a certificate citing the winners' contributions. The prize was endowed in 1984 as a memorial to and in recognition of the accomplishments of J. J. Sakurai by his family and friends. For more details, see the articles listed below. G.S. Guralnik, C.R. Hagen, and T.W.B. Kibble, "Global Conservation Laws and Massless Particles," Physical Review Letters, Volume 13, p. 585, 1964. Peter W. Higgs, "Broken Symmetries and the Masses of Gauge Bosons," Physical Review Letters, Volume 13, p. 508, 1964. F. Englert and R. Brout, "Broken Symmetry and the Mass of Gauge Vector Mesons," Physical Review Letters, Volume 13, p. 321, 1964. L. Gresh, "Nobelist Steven Weinberg Praises Professor Carl Hagen and Collaborators for Higgs Boson Theory."